This evening’s service is a Choral Evensong at 6pm. Please note the times and dates of services there is not a service on every Sunday evening. This is a new group typically meeting on the third Wednesday of the month in a local pub to discuss everyday ethics and how the things we think and do relate to our understanding of God and faith. This promises to be a lively and generous discussion, so do come and join us! To sign up or for further information, speak to Dan. We begin our Lenten observations on Ash Wednesday, which this year falls on 6th March. As usual there will be a said lunchtime service at 12.00 noon. In the evening there will be a sung Eucharist at 8.00pm, the setting Palestrina’s Missa Brevis, featuring Allegri’s Miserere and Walton’s Drop, Drop Slow Tears. If you still have your palm crosses from last year, bring them in and we will burn them to make this year’s ash. During Lent we will join with St George’s and Grosvenor Chapel to explore the dynamics of God’s calling and sending in our lives. Join us on Wednesdays at 7pm for a light supper, followed by a short talk and lively discussion amongst friends old and new. Across the five sessions we’ll discuss the ways in which we are loved and received by God and how this gives us the freedom deal with the pressures we face with an imaginative and compassionate response. To sign up, please see the list at the back of church, or talk to Dan. Bible Book Club meets once a month to read and to discuss the gospel reading for the coming Sunday and concludes with Compline. Meetings normally take place on the first Wednesday of the month but as there will be our usual Lent course at Grosvenor Chapel during Lent on Wednesday evenings the next meeting will take place on 1st May. For further information, speak to one of the clergy. The parish electoral roll is an indication of the life and vitality of St John’s. Inclusion on it is a part of your commitment to the church. Further, you must be on the electoral roll in order to participate in our annual meeting. Every six years we are required to dissolve the current roll and to compile a brand new one. As we last did this in 2013 we are compelled to compile a new roll this year and will be taking applications for entry onto the new roll until 20th March 2019. The roll will then be closed until after the annual meeting on 7th April. Application forms are available in the porch. Once completed, please return them to Bryan Sollenberger or send to the parish office. Roll up! Roll up! We’ve now had sponsorship of 33 buttresses and only seven remain! A huge thank you to everyone who has supported our appeal. To date, 24 individuals or households have made donations, along with everyone who came to the quiz night last June or who purchased a ticket for the Dog Collar Dinner. 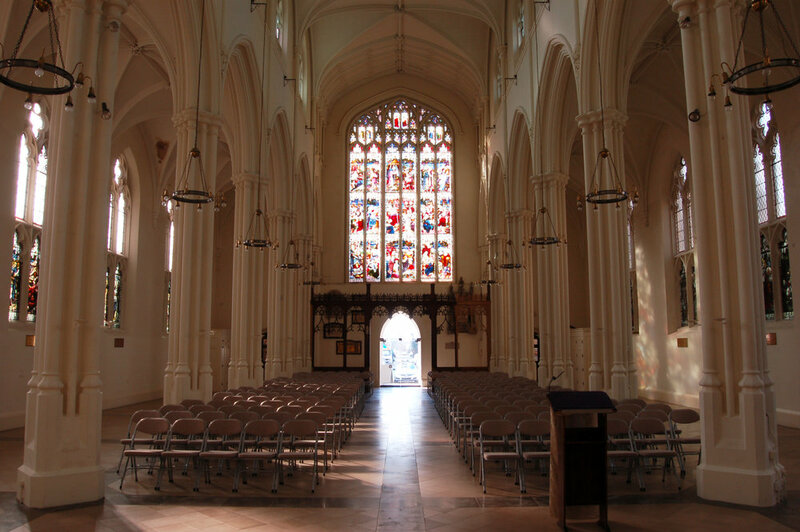 The ‘Sponsor a Buttress’ campaign is raising funds to cover this year’s commitment to repaying the loan from the Diocese of London towards last year’s roof works. There are 40 buttresses consisting of three stones each. A stone costs £416, a buttress £1,250 (£333 and £1,000 respectively if Gift Aided). To sponsor a stone or buttress or for more information about Gift Aid, speak to Bryan Sollenberger. This week saw the third annual St. James & St. John Poetry Week, with finals that took place on Thursday at St. John’s. At the time of print no winners had been confirmed yet, but we congratulate all who won the prestigious prizes. From performing to presenting: Year 5 presented some examples of their learning so far this year as they reflected on their studies of Ancient Egypt, alchemy and the works of Shakespeare and their adventures into outer space. To Fundraising: The St. James & St. John Children’s Fundraising Committee continues its Penny War event to raise funds for new school equipment to be used during lunch times. Back to Performance: Reception and Year 1 attended a performance of the play It’s Hot, It’s Not at the Unicorn Theatre this week. A surreal and funny investigation of the changes in seasons and the weather, the performance was enjoyed by all the students. Finally, Dancing: The Spring Term PFA School Disco took place on Thursday in the Main Hall. It was amazing to see how the PFA managed to transform the school into a disco hall and see our children (and also plenty of teachers) dancing and having fun. Term holidays are next week.